The castle of Santueri (Castell de Santueri / Castillo de Santueri) is a medieval castle located on the Puig de Santueri, near the south-east coast of Majorca. 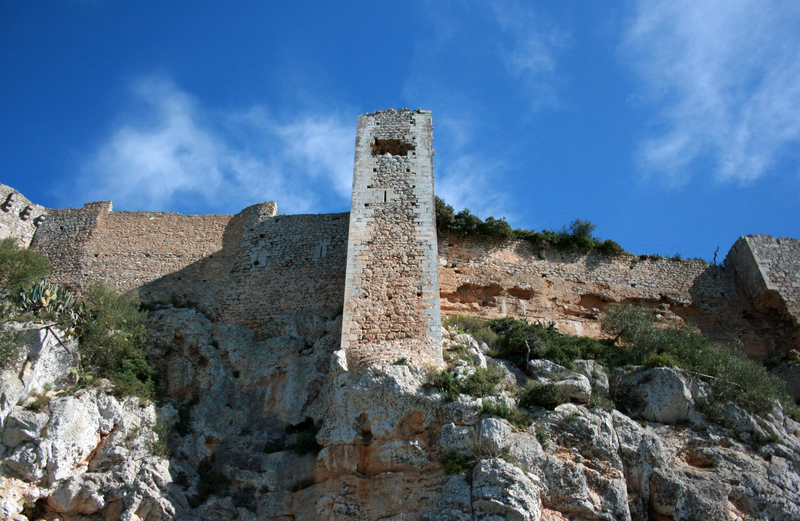 This is one of three castles mountain of the island, with the castle of Alaró and the Castell del Rei near Pollença, this is the most complete and best preserved of the three. The name of "Santueri" clearly refers to the presence of a shrine at the top of this mountain, the Latin word "Sanctuarium" sanctuary. There was probably during the Roman occupation or earlier, in prehistoric times, a place of worship here. According to geographer Granada Al-Zuhri, the castle was called under the Moorish occupation, Hisn Falanis, a word close to Felanitx. In the collection of land in the possession of Count Nunyo Sanç, the castle appears under the name "Santoris". Over the centuries it appears with different spellings: San Tueri, Santueri, Sentueri, Santuiri, et cetera. The castle is built Santueri against the southwest wall of the Puig de Santueri. Puig de Santueri is lined tray, except the southwest, a nearly vertical cliff collapse, making it a stunning natural fortress. The castle was built in the only point where the top of the Mount was accessible, so completely close access to the plateau. 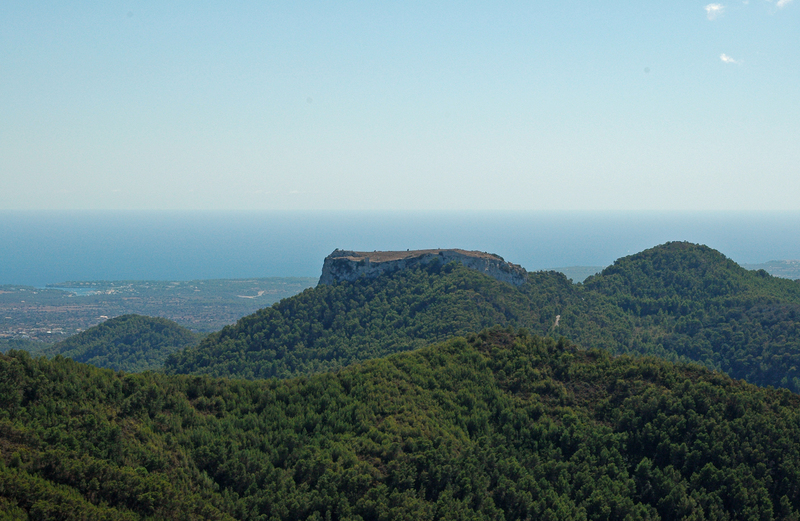 Puig de Santueri is one of the highest peaks in the southern part of the Serra de Llevant, it peaks at 423 m altitude. 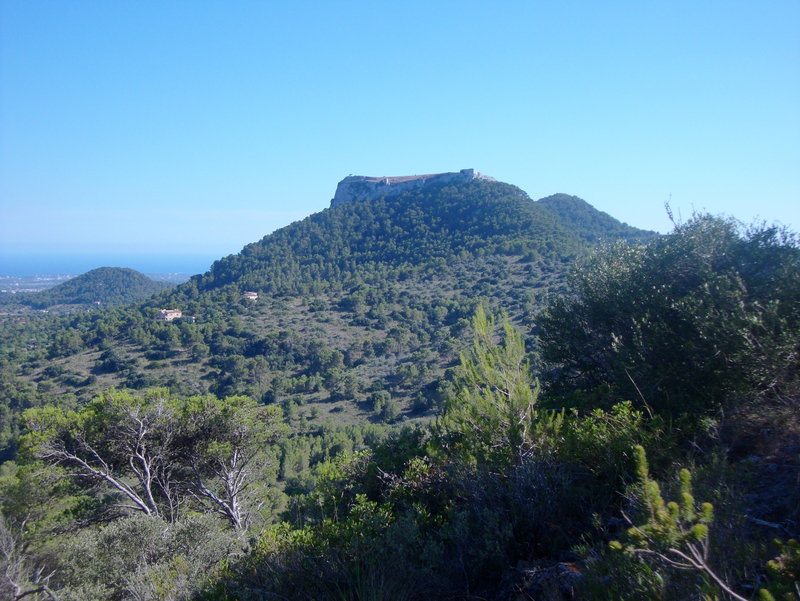 The castle entrance is located at an altitude of about 380 m.
The castle is located 7 miles southeast of Felanitx and is accessible from the road between Felanitx and Cas Concos des Cavaller and Santanyí, Felanitx after 2 km, take a small road on the left, and up to the castle 5 km. This small road is marked with a sign saying "Camí de Binifarda" finca practicing agro-tourism. 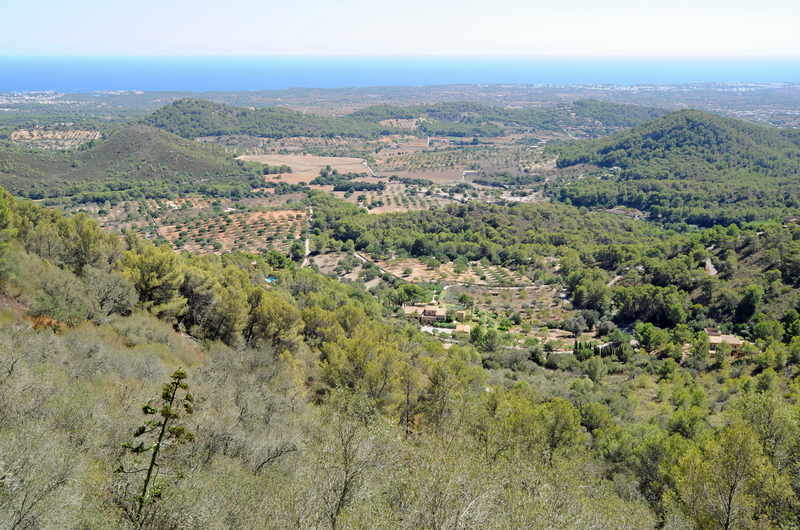 From the castle offers a magnificent view to visitors: a large part of the east coast of county of Migjorn from Portocolom to Cala d’Or and Porto Petro. At the foot of the castle lies the villages of S’Horta and Calonge. From the plateau - where access is possible there - you can see the north, the Sanctuary of Sant Salvador in Felanitx, to the west, the plain of Mallorca (Es Pla de Mallorca), to the south, when the weather is clear to the island of Cabrera. 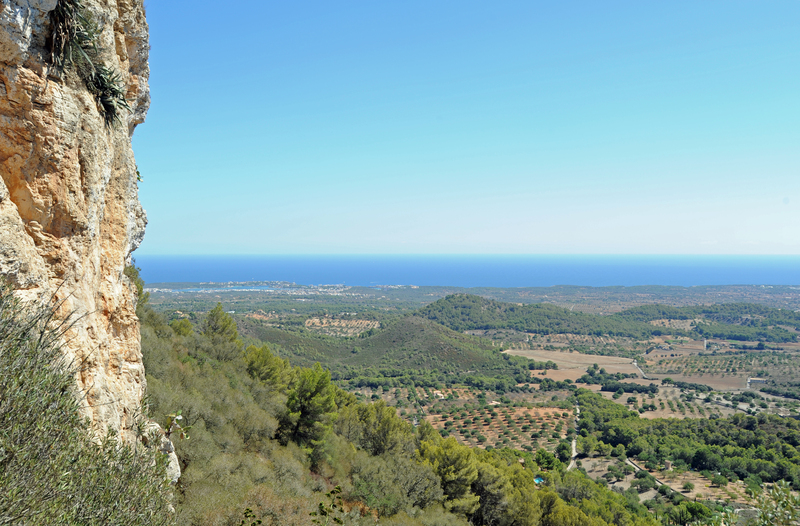 It is believed that there was a fortress on the Puig de Santueri since the time of the Roman occupation from 123 BC, the fortress was to oversee the Roman ports of south-east coast. We know from a text geographer Granada twelfth century, Al-Zuhri, the Muslim conquest of the island in 903, that of the three fortresses conquered by the armies of Hicham El Khaoulani there was a fortress called Hisn Falanis, coinciding with the nearby town Felanitx and the other two were the fortresses of Alaró (hisn Alarun), northwest, and the Castell del Rei (hisn Bullânsa) to the north, near Pollença. After the conquest, King Jaume I of Majorca distributed land among his vassals and those who helped in the campaign. The king kept to himself the lion’s share - about half of the island, including the fortresses of Alaró and Castell del Rei. Much of the southeast of the island - including the castle of Santueri - was given to his uncle, Nunyo Sanç, Count of Roussillon (comte de Rosselló). As archives of the Sanç family, kept in Perpignan and Montpellier were largely lost, there is little historical sources on the Castle of Santueri during the thirteenth century. The castle returned to royal domain in 1300. In the fourteenth century, from 1316, major reconstruction of the fortress were undertaken in order to protect the coast against attacks by Barbary pirates. The walls and towers were rebuilt and, inside, the chapel was restored and built a mill. It is this time that the present appearance of the castle. The fortress was headed by a governor, assisted by a lieutenant and a garrison of soldiers whose number varied according to the situation of peace or war. However, the castle of Santueri was theater is no significant weapons. In the fifteenth century, in 1459, Prince Charles of Viane (Carlos de Viana) was imprisoned in the castle on the orders of his father, John of Aragon, with whom he was at war. In 1489, the Tower of Homage (Torre of Homenatge / Torre del Homenaje) was restored. In the sixteenth century, between 1521 and 1523, when the revolt of "germanies" (brotherhood), the castle served as a refuge for a large number of "mascarats" the party of the rich nobles, opponents "germanies", the party of peasants and artisans in revolt. From the seventeenth century, the castle lost its strategic importance due to the development of the artillery was fortresses perched on the mountains, easy targets, in contrast, the artillery fire down from fortresses, were difficult. The rapid decay of the castle of Santueri began in the eighteenth century, and in 1811 it was sold to an individual. This ruined castle is surrounded by an aura of mystery: the Archduke Luis Salvador of Austria itself reports that the castle is reputed to be haunted by ghosts. The legend also wants no traveler drink water from his tank. The Castle of Santueri is backed by the cliff formed by a wall pierced with loopholes, and probably flanked by square towers of Moorish origin. 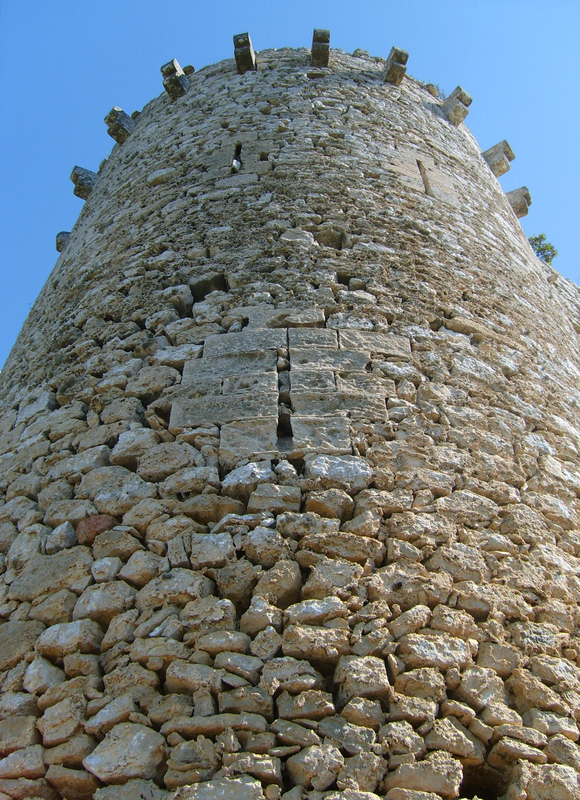 Only the tower of Homage, which dates from the sixteenth century, is circular, and it protects the front gate. Some walls and floors were constructed using the technique of opus spicatum, very characteristic of the Middle Ages, which is to have the stones shaped ear of corn (Latin spica, ear). 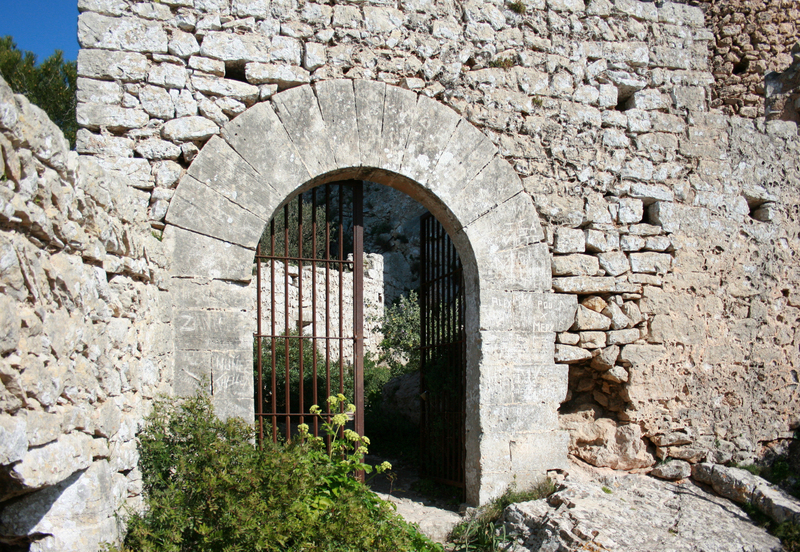 One enters the fort through a portal arch, located on the main facade. Inside are the ruins of a few buildings, such as the guard room and housing the governor, tanks and underground warehouses to store water and food for the garrison there is a small spring, which probably fed the tank. There are also inside the enclosure, a chapel, the Chapel of St. Bernard (capella de Sant Bernat), a mill and some farmland. The Castle of Santueri is privately owned. Following vandalism and theft of archaeological finds, the castle was closed to visitors. It was to be reopened in 2012 after ten years of restoration, but always seems closed. Although it is not possible to enter the castle, it is always interesting to visit because of the parking terrace offers beautiful views of the south east coast of Majorca, and we can always admire the walls and the towers of the fortress. On the slopes of the Puig de Santueri is a charming rural hotel, the finca Binifarda, which has only a few rooms.